AV Direct have acquired a partnership with an international supplier for daylight and outdoor LED screens. The European LED models are very well priced and there are quantities in South Africa for hire. The sizes are from 1024mm x 768mm per a cabinet. They can be built on structures in 4 x 3 ratio. There are Virtual 16mm pitch LED screens and 20mm outdoor LED screens. There are many different applications one can use for these screens besides outdoor video. They provide potent visual graphics for dance shows and DJ acts. 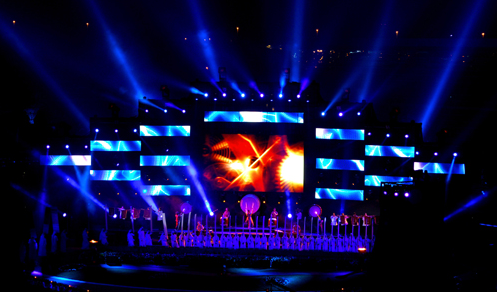 These shows combine visualizations and lighting to enhance the overall effect of the event. This triangular shaped LED screen setup is great for LIVE DJ performances. The most cabinets needed will be 18. However smaller setups in a similar style can work great. This is a really awesome design for events. The screens create a large curve and give a really modern look at events. For onstage these screens can be setup to provide space for lighting fixtures to be rigged through the screen. This will create amazing visual effects for events. This structure built with scaffolding allows space for rigged LED screens around a DJ booth.